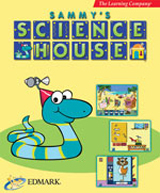 Lovable characters Bailey, Millie, Sammy and Trudy will guide your children in developing critical skills and confidence with a multi-sensory environment where they can explore the fundamentals of math, reading, science and the physical world around them. Observe, analyze and test theories just like a real scientist! Plus, learn about assembling objects by choosing parts, changes in seasons, conserving natural resources and much more in activities such as Create-a-Critter and Recycle It! Construct in the Workshop: Clocks tick, wheels spin, and robots spring to life as kids follow blueprints or create original machines and toys. Drop in at the Sorting Station: Three horns... It's a triceratops! Kids sort pictures of objects and learn the names of plants, animals, rocks and fungi. Discover the Wonders of Nature: What do shrews eat? Why does a squirrel flick its tail? Visit Acorn Pond during winter, spring, summer, and fall to explore its fascinating wildlife. Make Your Own Weather: Kids learn weather terms, experiment with temperature, wind and precipitation, and see the effects of different variables. Play with the Order of Things: Kids learn about beginnings, middles and ends and explore how things in nature change over time as they arrange frames of film in logical sequences to Make-A-Movie. Teach your child to observe, analyze and test theories like just like a scientist. Assemble objects by choosing parts. Understand adaptations to different environments. Recognize the importance of conserving natural resources. Practice skills in differentiation, systems, changes in weather, changes in properties, living organisms, animals and natural resources.